To counter the presumption in favor of the public’s common law right of access to court records, Allstate argues that the Court should seal the documents designated Exhibits 7, 31, and 31A because other courts have found similar insurance materials to be confidential in nature, and thus subject to a protective order. Allstate also asserts that it would be prejudiced in litigating other claims arising from Hurricane Katrina if plaintiffs in those other cases had access to the exhibits outside of the normal course and scope of discovery. The Court finds that neither interest is sufficient to overcome the right of public access in this instance. Allstate does not point to a single document or excerpt of a document within the approximately 185 pages that comprise Exhibits 7, 31, and 31A that might be harmful to its competitive position. Its failure to do so is particularly telling given the facially benign nature of these exhibits. Exhibit 7 includes a press release, a list of publicly available phone numbers, tips to policyholders affected by Hurricane Katrina, and suggested answers for its personnel to use when responding to questions from policyholders with hurricane claims. Exhibit 31 and 31A contain customer service guidelines to be followed by Allstate personnel, including information that was intended to be passed along to customers. It is not apparent that these documents contain sensitive material of any kind. Judge Vance’s use of the word benign provides an interesting contrast to “our documents are malignant” espoused by insurer defendants in Katrina policyholder litigation. As a result, there has been an epidemic of protection orders in federal courts in both Mississippi and Louisiana. However, as the Order indicates, insurers cry “malignant” but submit the “benign”. Breaking: Senator Jim “Dumb” Bunning flips off the Nation. The NFIP has expired. Hope you don’t flood today. Author Posted on March 1, 2010 Categories SopTags National Flood Insurance Program, Senator Chris Dodd, Senator Jim Bunning, Senator Max Baucus7 Comments on Breaking: Senator Jim “Dumb” Bunning flips off the Nation. The NFIP has expired. Hope you don’t flood today. Ronald Bodenheimer was a judge in Jefferson Parish, Louisiana, convicted of various federal charges resulting, in part, from an FBI probe called Operation Wrinkled Robe. Bodenheimer spent more than three years in federal prison, additional time in a half-way house, and was released on September 21, 2007, to serve the remainder of his term under probation under house confinement. 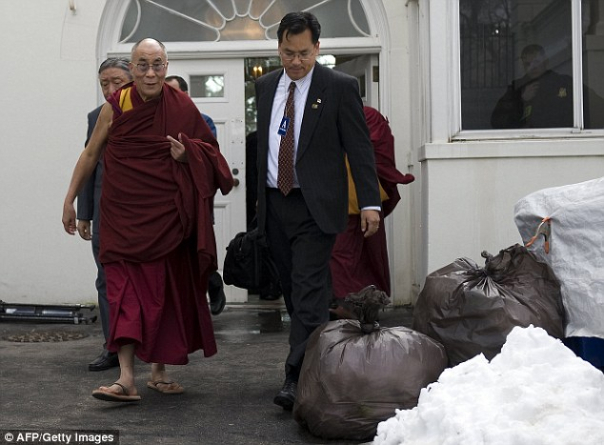 The Dalai Lama Leaves the Whitehouse. Desiree strikes again.